Congratulating the ALA Youth Media Award Winners, and interviews with Shea Fontana and Nidhi Chanani! Special Note: We have prepared a short (5-minute!) questionnaire to help us guide our editorial coverage. If you have not done so already, click here to answer it by this Wednesday, February 28th. Complete it, and you can enter to win copies of THREE books that are coming out in March! Of course, that's not the only big news this month. DC Comics announced the start of a new imprint, DC Zoom, targeted towards middle grade readers. It's no secret that superheroes are more popular than ever, so it only makes sense for the legendary comic book publisher to begin to introduce young readers to iconic characters like Superman, Batman, Wonder Woman and many more. 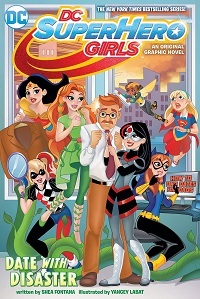 The first title from this imprint will be released this fall, but in the meantime, you can get a taste of what to expect with the hit series DC Super Hero Girls, which is now on its sixth installment, DATE WITH DISASTER. In celebration of DC's big news, we not only reviewed DATE WITH DISASTER, but our reviewer, Katherine Szabo, also interviewed the author, Shea Fontana, and illustrator, Yancey Labat, about working with such popular characters, writing for young girls and what they hope to see next in the series. Click here to read our review, and click here to read the interview. 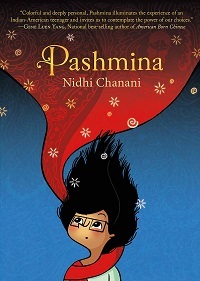 We also spoke with author Nidhi Chanani, whose graphic novel, PASHMINA, we reviewed last year. PASHMINA felt like an instant classic to us, and we were so happy to speak with Nidhi about her process, artistic style and what she's working on next. Click here to read our interview with Nidhi. With March just around the corner, I want to make sure that BECOMING MADELEINE by Charlotte Jones Voiklis and Léna Roy is on our readers' radar. 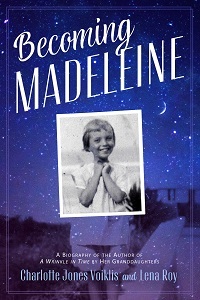 This biography of the acclaimed author Madeleine L'Engle is written by two of her granddaughters and includes lots of never-before-seen photos, poems, letters and journal entries. Through all of these elements and more, Madeleine's granddaughters track her journey from childhood to the release of A WRINKLE IN TIME. With this beloved classic making its film debut on March 9th, there's no better time to learn about author Madeleine L'Engle. Click here to read our review, and don't forget to check out the film next week! 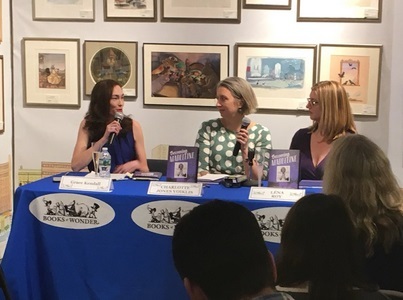 I was able to meet Charlotte and Léna on their book tour; it was exciting to hear them talk about their grandmother, who is one of my favorite authors. Charlotte and Léna shared that their grandmother did not intend to write for children; she just wrote something she wanted to read. They tried to do the same thing with BECOMING MADELEINE, and they definitely succeeded! They also talked a lot about Madeleine's ambition and love of reading, both of which clearly shine through her works. You can see a photo of Charlotte and Léna above --- that's Charlotte in the middle and Léna on the right. 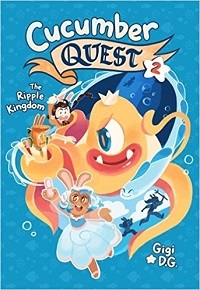 Read on for this month's series update (we've added titles to 33 series, including Cucumber Quest, The Map to Everywhere and Sci-Fi Junior High) and a ton of new reviews. As we work on our Kidsreads editorial plans, we would like to know a bit more about you, which will help us to guide our coverage! Thus we created a quick and easy questionnaire. As a thank you for your time, those who complete the survey can enter to win one of two sets of advance copies of these March releases: EMILY WINDSNAP AND THE FALLS OF FORGOTTEN ISLAND by Liz Kessler, ARU SHAH AND THE END OF TIME (A Pandava Novel Book 1) by Roshani Chokshi, and THE SPINNER PRINCE by Matt Laney. Please note that if you are under the age of 13, you will need a parent to fill out the contest form for you. We will collect responses between now and Wednesday, February 28, 2018 at 11:59pm ET. Click here to answer our questionnaire! Monday, February 12th, was one of the biggest days of the year for children's literature: the announcement of the ALA Youth Media Awards. Each year the American Library Association honors the books, videos and other outstanding works that have released that year for kids and teens and are recognized worldwide for the high quality they represent. We've compiled all of the children's awards announcements on our blog, so click here to see which of your favorites made the cut! 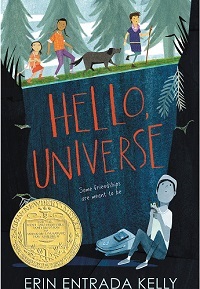 We're happy to congratulate Erin Entrada Kelly, whose book, HELLO, UNIVERSE, won the Newbery Medal, and Matthew Cordell, whose book, WOLF IN THE SNOW, won the Caldecott Medal! It might be a new year, but superhero stories never go out of style. With so many superheroes and adaptations to choose from, it can be tough to find the perfect read for you and your children. One of our favorite middle grade series is Shea Fontana's DC Super Hero Girls, a graphic novel series set at Super Hero High, where well-known DC heroes, both male and female, not only attend classes, but also deal with all the awkwardness of growing up --- oh, and superpowers. The sixth book in the series, DATE WITH DISASTER, is now in stores, and our reviewer, Katherine Szabo, had the pleasure of interviewing the author, Shea Fontana, and illustrator, Yancey Labat, about their process, the series and, of course, their favorite super heroes. Catwoman is out alone on the prowl one night when KABOOM --- an explosion at S.T.A.R. Labs! Star students Batgirl and Lois Lane both know the lab incident is fishy, and they meet later to share clues. But nothing could've prepared Batgirl for what they see next --- Batgirl's dad on a date! The girls place a personal ad for Commissioner Gordon while they investigate the explosion, but they're about to discover more than who is behind the attack on S.T.A.R. Labs. Could it be that posting an ad looking for dates for the commissioner is like advertising catnip for criminals? Reviewed by Katherine Szabo. One of our favorite releases of 2017 was Nidhi Chanani's PASHMINA. In this graphic novel, a young Indian-American girl struggles with her mother's lack of answers to questions about her past. Priyanka desperately wants to know who her father was, and why her mother left India so many years ago, but her mother refuses to answer. But when Priyanka discovers a magical pashmina scarf in her mother's closet, she is transported to a fantastical, colorful version of India that just might hold some answers. Blending snippets of her own youth with bold, vivid colors and a lot of imagination, Nidhi Chanani weaves a powerful tale of self-discovery, blending cultures and identity. We recently had the opportunity to ask Nidhi a few questions about her inspiration for the book, how she balances her writing/drawing process and what she's working on next. Word of Mouth: Tell us about the books you’ve finished reading with your comments and a rating of 1 to 5 stars. During the contest period from February 16th to March 2nd at noon ET, three lucky readers each will be randomly chosen to win a copy of THE HUSH by John Hart and SUNBURN by Laura Lippman. Sounding Off on Audio: Tell us about the audiobooks you’ve finished listening to with your comments and a rating of 1 to 5 stars for both the performance and the content. During the contest period from February 1st to March 1st at noon ET, two lucky readers each will be randomly chosen to win the audio versions of Tara Westover's EDUCATED: A Memoir, read by Julia Whelan, and Sophie Kinsella's SURPRISE ME, read by Fiona Hardingham. Win 12 Copies of A PIECE OF THE WORLD by Christina Baker Kline for Your Group: Each month, we ask book groups to share the titles they are reading that month and rate them. From all entries, three winners will be selected, and each will win 12 copies of that month’s prize book for their group. Note: To be eligible to win, let us know the title of the book that YOUR book group is CURRENTLY reading, NOT the title we are giving away.This month's prize book is the paperback edition of A PIECE OF THE WORLD by Christina Baker Kline, a stunning and atmospheric novel of friendship, passion and art, inspired by Andrew Wyeth’s mysterious and iconic painting, Christina’s World. This edition includes a color reproduction of Christina’s World, along with a Q&A with bestselling author Kristin Hannah and a bonus short story, “Stranded in Ice.” The deadline for entries is Thursday, March 8th at noon ET. Win 12 Copies of ISLAND OF SWEET PIES AND SOLDIERS by Sara Ackerman for Your Group: In ISLAND OF SWEET PIES AND SOLDIERS, the Pacific battles of World War II continue to threaten American soil, and on the home front, the bonds of friendship and the strength of love are tested. We are celebrating the release of Sara Ackerman's debut novel with a special contest that will give three readers the chance to win 12 copies of the book for their group. The deadline for your entries is Thursday, March 22nd at noon ET. Win the Audiobook Edition of Kristin Hannah's THE GREAT ALONE and Share Your Comments on It: ReadingGroupGuides.com is proud to host a very special audiobook contest for Kristin Hannah's latest novel, THE GREAT ALONE. Ten book groups will win up to six digital or physical copies of the audiobook. In order to qualify as a winning group, your group must be able to commit to listening to and discussing THE GREAT ALONE, and sharing your group's feedback with us, by Friday, May 18th. Additionally, we'll be giving 40 listeners a physical copy of the audiobook. We strongly encourage all winners to share their experiences on social media, including reviews on Amazon, Goodreads and Bookreporter.com’s “Sounding Off on Audio” feature. The deadline for your entries is Thursday, March 8th at noon ET. This elegant and insightful biography of Madeleine L’Engle (1918–2007) was written by her granddaughters, Charlotte Jones Voiklis and Léna Roy. 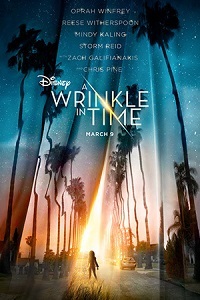 Using never-before-seen archival materials that include photographs, poems, letters and journal entries from when Madeleine was a child until just after the publication of her classic, A WRINKLE IN TIME, her granddaughters weave together an in-depth and unique view of the famous writer. It is a story of overcoming obstacles --- a lonely childhood, financial insecurity, and countless rejections of her writing --- and eventual triumph. BECOMING MADELEINE will speak not only to fans of the icon’s work, but also to anyone interested in writing. Reviewed by Christine M. Irvin. Eleven-year-old Frances is an observer of nature and people, just like her idol, the anthropologist Margaret Mead. She spends most of her time up on the rocks behind her house. 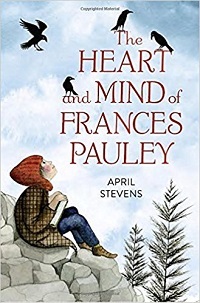 It's the one place where Frances can truly be herself, and where she doesn't have to think about her older sister, who is growing up and changing in ways that Frances can't understand. 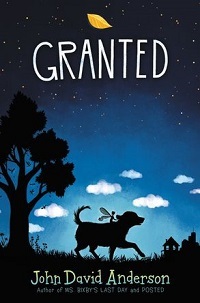 But when the unimaginable happens, Frances discovers that perhaps the world outside her hidden paradise isn't so bad after all, and that maybe she can find connection with the people who have surrounded her all along. Reviewed by Sarah Rachel Egelman. In a magical land called the Haven lives a young fairy named Ophelia Delphinium Fidgets. Ophela is no ordinary fairy --- she is a Granter: one of the select fairies whose job it is to venture out into the world and grant the wishes of unsuspecting humans every day. Today, however, is anything but typical. Because today, Ophelia is going to get her very first wish-granting assignment. And she’s about to discover that figuring out how to truly give someone what they want takes much more than a handful of fairy dust. Reviewed by Liz Sauchelli. 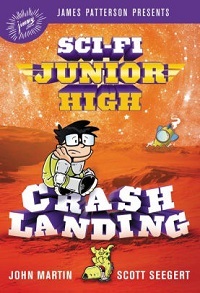 Kelvin is the new kid at Sci-Fi Junior High --- a floating space station filled with alien kids form across the universe. And he arrived just in time for the annual school dance: The Galactic Get Down! Kelvin is desperate to take luminous Luna (her species literally glows), but now that his secret about not being a Mega Supergenius is out, Kelvin doesn't have a shot. Cue mad scientist Erik Failenheimer's escape from his asteroid prison, an army of Pinions (any similarities to the MinionsTM is purely coincidental) and a battle to save Sci-Fi Junior High from imminent doom. Let's dance! Reviewed by Dana Cuadrado. Claire Martinson still worries about her older sister Sophie, who battled a mysterious illness last year. But things are back to normal as they move into Windermere Manor...until the sisters climb a strange ladder in a fireplace and enter the magical land of Arden. There, they find a world in turmoil. The four guilds of magic no longer trust each other, the beloved unicorns have disappeared, and terrible wraiths roam freely. Scared, the girls return home. But when Sophie vanishes in the night, it will take all of Claire's courage to climb back up the ladder, find her sister and uncover the unicorns' greatest secret. Reviewed by Dana Cuadrado. When the Problim children’s ramshackle bungalow in the Swampy Woods goes kaboom, the seven siblings --- each born on a different day of the week --- have to move into their grandpa’s bizarre old mansion in Lost Cove. But rumors about their family run rampant in the small town: tales of a bitter feud, a hidden treasure, and a certain kind of magic lingering in the halls of #7 Main Street. Their neighbors, the O’Pinions, will do anything to find the secrets lurking inside the Problim household --- including sending the seven children to seven different houses on seven different continents! Reviewed by Christine M. Irvin. One of the first naturalists to observe live insects directly, Maria Sibylla Merian was also one of the first to document the metamorphosis of the butterfly. In this visual nonfiction biography, richly illustrated throughout with full-color original paintings by Merian herself, the Newbery Honor–winning author Joyce Sidman paints her own picture of one of the first female entomologists and a woman who flouted convention in the pursuit of knowledge and her passion for insects. Reviewed by Sarah Rachel Egelman. Emmeline's gift of controlling shadows has isolated her from the rest of the world, but she's grown to be content, hidden away in her mansion with Dar, her own shadow, as her only company. With the noble's guards on her trail, Emmeline's only hope of clearing her name is to escape capture and perform the ritual that will set Dar free. But Emmeline's not sure she can trust Dar anymore, and it's hard to keep secrets from someone who can never leave your side. 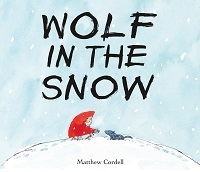 Reviewed by Kathleen M. Purcell. Arlo Finch thought becoming a Ranger meant learning wilderness skills, like camping and knots. But upon arriving in the tiny town of Pine Mountain, Arlo soon learns there's so much more. His new friends Indra and Wu teach him how to harness the wild magic seeping in from the mysterious Long Woods --- a parallel realm of wonder and danger. A dark and ancient force is sending threats into the real world...our world. 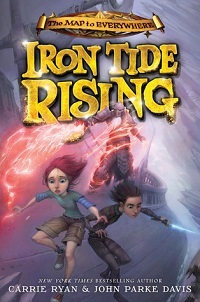 Through perilous adventures and close calls, Arlo is awakened to his unique destiny --- but the obstacles he faces will test the foundations of the Ranger's Vow: loyalty, bravery, kindness and truth. Reviewed by Emi Debos. In a rich embroidery of visions, musical cadence and deep emotion, Andrea and Brian Pinkney convey the final months of Martin Luther King's life --- and of his assassination --- through metaphor, spirituality and multilayers of meaning. Andrea's stunning poetic requiem, illustrated with Brian's lyrical and colorful artwork, brings a fresh perspective to Martin Luther King, the Gandhi-like, peace-loving activist whose dream of equality -- and whose courage to make it happen --- changed the course of American history. And even in his death, he continues to transform and inspire all of us who share his dream. Reviewed by Sarah Rachel Egelman. Harriet Tubman was born a slave and dreamed of being free. She was willing to risk everything --- including her own life --- to see that dream come true. After her daring escape, Harriet became a conductor on the secret Underground Railroad, helping others make the dangerous journey to freedom. Reviewed by Christine M. Irvin. This beautifully illustrated collection tells the awe-inspiring stories of 50 women who have pushed the boundaries of human excellence and endeavor. Featuring familiar icons like Elizabeth I and Malala Yousafzai, and introducing hidden figures like Chien-Shiung Wu and Aud the Deep-Minded, kids will be fascinated reading about these women's achievements in science, sports, the arts, politics and history, and it is sure to inspire a new generation of extraordinary girls! Reviewed by Sally Tibbetts. It is December 17, 2010: Nadia’s twelfth birthday and the beginning of the Arab Spring. Soon anti-government protests erupt across the Middle East and, one by one, countries are thrown into turmoil. As civil war flares in Syria and bombs fall across Nadia’s home city of Aleppo, her family decides to flee to safety. Inspired by current events, this novel sheds light on the complicated situation in Syria that has led to an international refugee crisis, and tells the story of one girl’s journey to safety. Reviewed by Kat Baumgartner. In Magikos, life is dictated by the Book of Fate's ancient predictions, including the birth of a royal Chosen One who will save the realm. Princess Marabel has grown up in the shadow of her twin brother, Marco, who everyone assumes is the true Chosen One. But on the night of their thirteenth birthday, Marco is kidnapped by an evil queen, and Marabel runs to his rescue. Outside the castle walls for the first time, Marabel embarks on a daring mission that brings her face-to-face with fairies, trolls, giants --- and the possibility that all is not as it seems in Magikos. Reviewed by Emi Debos. Frederick Douglass (1818–1895) is best known for the telling of his own emancipation. But there is much more to Douglass’s story than his time spent enslaved and his famous autobiography. FACING FREDERICK captures the whole complicated, and at times perplexing, person that he was. Statesman, suffragist, writer and newspaperman, this book focuses on Douglass the man rather than the historical icon. Reviewed by Melat E., Teen Board Member. CUCUMBER QUEST: The Ripple Kingdom by Gigi D.G.